Ride together through old Prague area and along Vltava river! Our River & Old City Tour takes you through the heart of Prague. We will go on 45 min ride filled with exiting feelings, old Prague architecture and with ever beautiful views of Letna park and Prague Castle. We always ride in the small groups from 3 to 6 people. If you would like to have private tour with your friend(s) or family, just let us know and we will find the right time and start place for you. 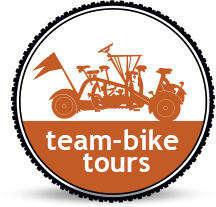 Come and ride with us on our always friendly and fun Team-bike! Rudolfinum & Jan Palach Sq. The tour is suitable for young and old, and for people who have never ride a bike!